Max, 99 and this episode's special guest star, The Bass Drum. Synopsis: After ballet troupe leader Emilio Naharana (the last of the world’s great leapers) steals Control’s new paralyzing drug Immobilo, Max and 99 attempt to retrieve it by infiltrating the Pinerovian embassy. Max sticks it to evil ballet dancer Emilio Naharana. This episode “kind of” starts where the previous episode, “Satan Place,” left off. The Chief is showing Max his “new” car, the ZFB600. Yes, this is the second appearance of the storied “Z the Zebra Car.” If you recall, at the end of “Satan Place,” it was revealed Max won the car in a raffle of all the Chief’s stuff. 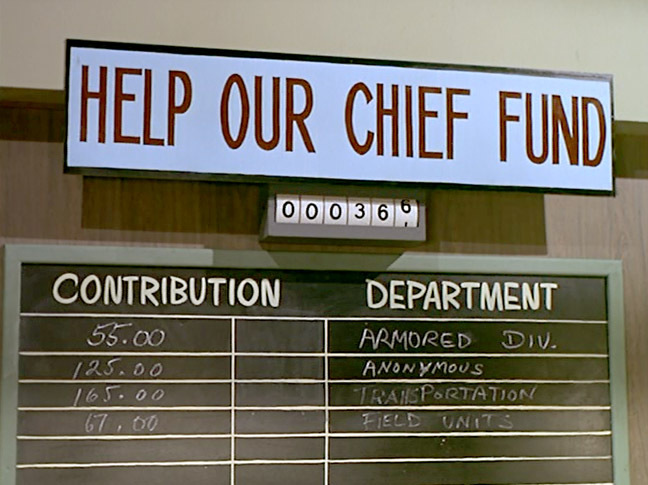 Now, if you’ve watched this episode during a heavily edited syndication cycle that shuffled Get Smart into a different order, *coughNickatNitecough* then you would just assume the Chief is assigning Max a new car for the heck of it. Z the Zebra Car makes a cameo appearance in "Our Man in Leotards." Max, by the way, would have preferred “Z the Zebra Car” had come in the color tan. Special to this episode, the car’s horn mechanism operates two 52-caliber machine guns mounted in the radiator. It’s also equipped with a radar tracking device and can transmit an emergency signal. Sticker price: $32,000. We observe two other details at the beginning of this episode after the Immobilo is stolen from Control’s lab. One, Robert Karvelas appears and is given a line and a name – Saunders. Later in season one he’ll have a new identity: Larabee. Secondly, we get to watch Max try to leap Control’s security fence in a single bound. He claims to have been the three-time winner of the spy school gold medal for high jumping. Always concerned with keeping conversations secure, Max advises they have their discussion in a foreign language. After rejecting French and arguing over Swahili, they settle on English. Max: OK, but don’t go too fast. The discussion is finally held in a firing range. • The bass drum. Naharana and Julio go into the instrument room to have a private chat while Max slices open the back of a bass drum and hides in it. What results is Naharana detailing his motives – not that we’re paying attention to that. I mean, how can we when Max is making all those ridiculous faces. 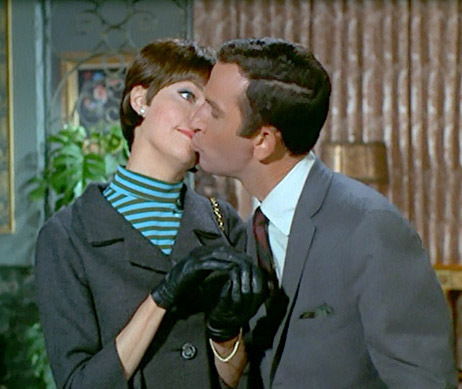 As mentioned in a past blog, Don Adams has been described as a facial actor. He takes this to the next level in this scene. 99: Max, what did you find out? Max: I found out something very important, 99. A human being can’t live in a bass drum. • That is a dancer! Max jabs a member of Naharana’s troupe with Immobilo and swipes his clothes. Unfortunately he fails to perform when tested. He finds himself crashing into into a door and blows his cover. In the end Max saves the day during Naharana’s temper tantrum about “decadent democracies” by sticking him with the Immobilo laced pen meant for Don Hernando. For his good work he’s awarded the “Legion of Honor” — well, at least temporarily. Somehow he manages to inject everyone in the room with Immobilo — including 99. Yes, now we get to that scene! Seeing that 99’s paralyzed with Immobilo, Max plants a kiss on her check, but it really doesn’t count since she not conscious and can’t feel it. He then takes it one step further. He tilts her head, kisses her again and jabs himself with Immobilo. All that’s left is speculation on what happened next. Watch for: Max’s bit in the bass drum and the infamous Immobilo kiss. Max plants a kiss on 99. She's not moved - because she can't move. 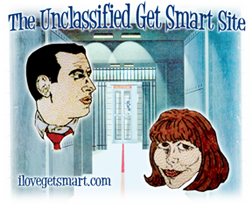 • Aside from the pilot episode, this is the only other episode written by Get Smart creator Mel Brooks. • Australian actor Michael Pate played many a villain. His credits include Hondo with John Wayne, a number of TV westerns and an episode of Mission Impossible. • French-born character actor Robert Carricart played Pepe Cordoza in the TV series T.H.E. Cat. He appeared in many other TV shows including in an episode of Mission Impossible. • Nestor Paiva’s acting career goes back to the late 1930s. He was best known for his role as innkeeper Teo Gonzales in Disney’s Zorro series. • John Stephenson’s voice is probably familiar to many a child of the 1970s and 1980s. He may be most well-known as the voice of Mr. Slate on The Flintstones. His other credits include: Scooby-Doo, The Transformers, The Jetsons, InHumanoids, G.I. Joe and The Littles. And he was in an episode of Mission Impossible. • Edward Colmans appeared in all kinds of TV westerns. 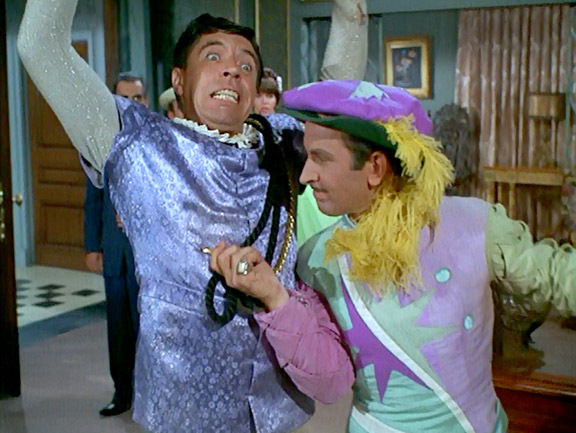 He made another appearance in Get Smart in the second season episode “Viva Smart.” He also appeared in Mission Impossible. • Robert J. Stevenson made repeated appearances on Have Gun-Will Travel, Bonanza and Rawhide. • There may be an inconsistency. Naharana calls the pact a mutual trade pact and later in the episode Don Hernando calls it mutual aid pact. Glick meter: When 99 suggests a hiding place in the bass drum, Max insists on handling the matter himself. Oh Max meter: After a handful of episodes with pursed lips and purrs, 99 finally gets a kiss from Max. Too bad she probably didn’t remember it. Kaos Agents: The episode doesn’t really indicate that Emilio Naharana and Julio are Kaos guys. Instead they represent a faction that is not favorable to the U.S. government. Naharana reveals his goal is to overthrow the Pinerovian government by keeping the people poor, tired and hungry. 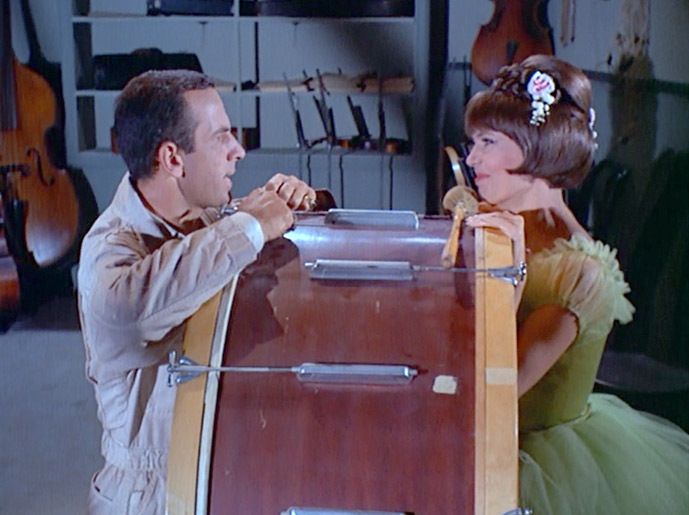 Don Adams shows us why human beings can't live in bass drums. Max tries to play doctor with Harvey Satan while Len Lesser skulks in the background. Synopsis: Just before the Chief can leave for vacation, he’s snatched by two Kaos hoods hiding in the trunk of his car. Kaos bad guy Harvey Satan demands $200,000 ransom and freezes the Chief for some sort of surgery that will make him work for Kaos. Max saves the day by playing doctor -and he wins the Chief’s car during Control’s fundraising efforts. Crowdfunding for the Chief of Control was done the hard way. This episode’s villain is a guy going by the name Harvey Satan who has his hair and beard cut like the devil. He runs his own “sanitarium,” which from what the viewer can see is frozen over. My toddler enjoys watching GS with me, though I had to put off watching this one until I had some alone time. A guy that looks like, well, Satan locking the Chief in a freezer may have been a bit too much to explain to a three year old. Nevertheless, it’s still a great episode for us big kids. Getting ransom money for the Chief proves to be a headache. It’s revealed that Control is so secret the State Department doesn’t know about it. Also, an appropriation through Congress would be too time consuming since it would take three months to pass. A call on the direct line to the president nets Control $12. To be noted, the hot line to the White House is kept in a red box. It’s not the horn phone of later episodes. Control, instead, gets creative. They resort to fundraising through a raffle – with the Chief’s property as prizes; a telethon and Hodgkins’ “Take A Chance On Our Chief” punch board. The whole effort rounds up a meager $600, the Chief ends up losing his nice furniture and Max is the new owner of his car. One note on that swank black and white car, it reappears in the beginning of “Our Man in Leotards.” The Chief in that scene is handing over the keys and demonstrating its specs. Dipping back to my page on the cars of Get Smart, that sweet ride is a Ford Mustang dubbed “Z the Zebra Car” According to Smartian Sue, the car was created by George Barris. His resume includes creating the Munster cars and the Batmoble. 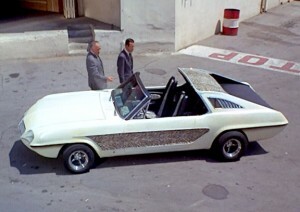 The Zebra Car also appearing in “Marriage on the Rocks” with Dean Martin and Frank Sinatra. Max has a fail early on when the Chief gets kidnapped. However, I think he tries to make up for that fowl-up throughout the episode. Not only does he, along with 99, successfully switch places with Dr. Von Havok, he also has an ah-ha moment in the nick of time. He realizes if he sets the thermostat in the operating room lower, he’ll have a window of opportunity to “freeze” Harvey Satan and co. in place. Max: Do you have a hair pin? Max: (pulling a Bobby pin out of his hair) I’ve got one. 99: (shooting Max a perplexed look) Max? Max: I use it for picking locks. Watch for: There’s some sort of phone obsession with this episode. Check out the rigmarole Max goes through to answer a call on the Chief’s private phone. Sheesh. Then there’s the bit in the park with all the hidden phones on Max’s person. A frosty Chief and a concerned 99. • The title of this episode is a reference to 60s prime time soap, Peyton Place. 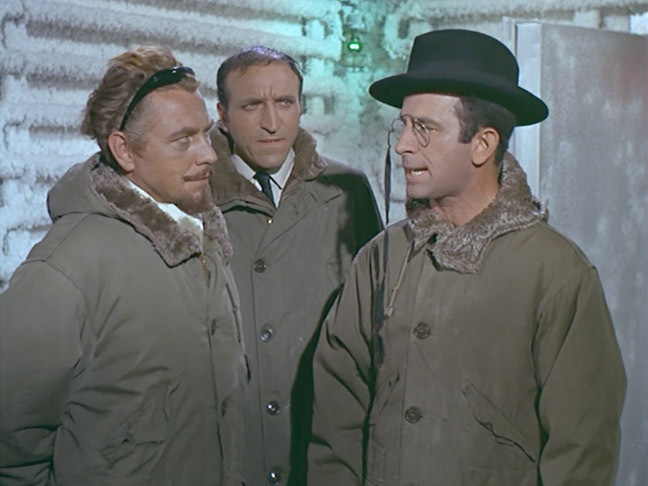 • Noted voice-over actor Joseph Sirola appeared as Van Cleff in the second season Get Smart episode, “Bronzefinger.” He also appeared in Hang ‘Em High and in an episode of Mission Impossible. • Len Lesser was known for playing Uncle Leo on Seinfeld. Among his many roles on TV and in the movies, he appeared in Kelly’s Heroes and on an episode of The Partners. 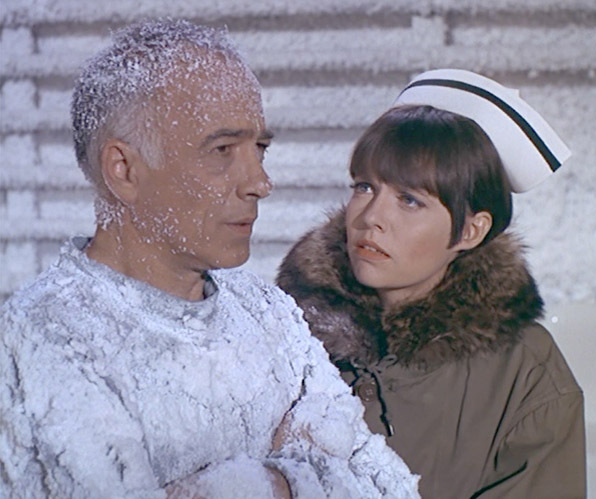 He appeared in two other Get Smart episodes: “The Decoy in season two and “The Spirit is Willing” in season three. • Roy Jensen appeared in numerous TV shows and movies including Every Which Way But Loose and The Love Bug. 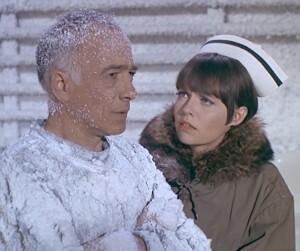 He also appeared in an episode each of Mission Impossible and Star Trek. Glick meter: We get a “Sorry about That” for our troubles. Oh Max meter: This episode finally breaks from the failed kiss routines that showed up previously. Instead, 99 gets weirded out when Max pulls a Bobby pin out of his hair. Control Agents: Windish and Hodgkins make appearances for this episode. Kaos Agents: Harvey Satan, Rudolph, Gregor, Dr. Laslow Von Havok, Nurse, Kaos agent in the mailbox and two Kaos agents in the Chief’s trunk. Gadgets: Phones galore including; wallet phone, eyeglass phone, necktie phone, handkerchief phone, belt phone, garter phone; a collapsible vaulting pole and caterpillar (suction cup) shoes – just don’t get them stuck to your hand. Z the Zebra Car's Get Smart debut. The real problem isn't under the hood - it's the junk in the trunk.